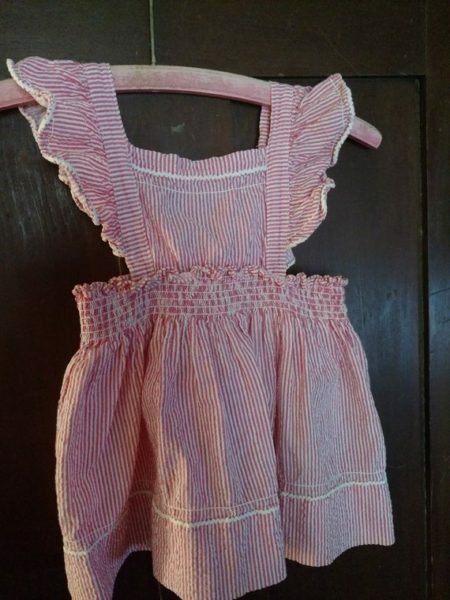 Oh my, look at this little charmer toddler girl sundress. Made of a pink-red and white stripe seersucker fabric, this little dress just spells cute. A pinafore style with wide ruffles over the shoulders. The ruffles are made to narrow at the back of the neck, ending in short ties which tie around the neck. Wide elastic is used at the waist, around both the front and back. Very cute, but the elastic does not have much stretch anymore. Skirt is full. A very narrow white rick rack embellishes the hem line and edge of the shoulder ruffles.